Laid out in front of me are plates piled high with all sorts of goodies: delicate translucent momos, mutton sausages, yak tongue, lung and tripe, a cinnamon laced dry yak curry, tea smoked roast duck, string beans. And Temba, our guide, is talking in Tibetan to the waitress ordering yet more plates. My stomach is rumbling in anticipation. I pick up my chopsticks and dig in. It’s the end of two weeks of hard driving and we’re sat in Phin Tsok Ge Don in Lhasa enjoying a meal in a restaurant packed with Tibetans. They’re singing, laughing, shouting and generally creating a happy cacophony. It’s a world away from tables of tourists poking at their food, grimacing at the taste of yak butter tea and wondering whether they should stick with the omelette. Phin Tsok Ge Don is a joint popular with the growing number of middle class Tibetans in Lhasa. And it gives the lie to any thought of Tibetan food as monotonous. 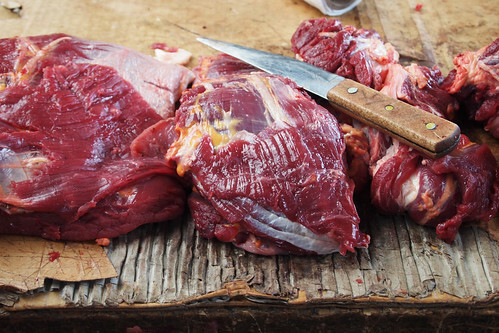 Sure there’s a lot of yak, but the things they can do with it… And they really do use every part of the animal, from braised tongue to fried lung, chilli tripe to cinnamon curry. Hell, they even hang the skulls above their doorways for luck. And yes, there are momos and Tsampa pretty much everywhere you go. But you could say the same about fish and chip shops and England. From stone-pot chicken to Bayi pork, there is more, a lot more to Tibetan food, particularly in the eastern regions we travelled. 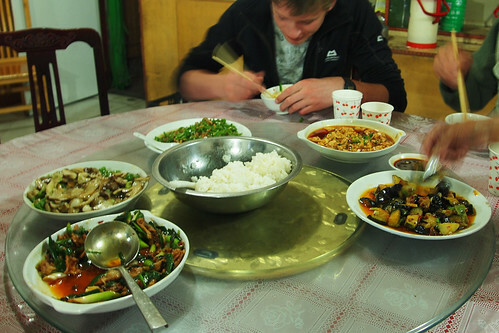 We ate superb Sichuan food in one simple roadside joint down the road from Basum Tso where the cooking was done on a wood burning stove and the toilet was a short-drop into the pig sty. And yet that simple kitchen churned out a seven dish lunch in about half an hour. I snuck into the kitchen for a peek and was astounded at the speed and skill as the chef grabbed ingredients, throwing them into the red hot wok, stirring and tossing in a blur of culinary creativity. Dish after dish came out: braised hot and numbing cabbage, spicy pork, gong bao chicken, fish flavoured aubergines, an amazing variety of stir fried mushrooms and fungi. All of it fresh, fragrant and delicious. 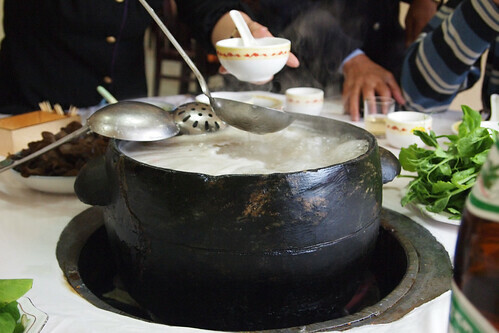 In the traditional village of Lulang we indulged in the local specialty, pieces of chicken cooked up in a great weathered stone cauldron full of broth sat in the centre of the table. It was full of all manner of herbs, roots and fruits. The Chinese travel hundreds of miles just to partake of this particular broth of medicinal goodness. We made do with crunching the chicken feet and chewing the pieces of coxcomb that blubbered their way to the top. Given that the chicken had been running around an hour or so before the meal started, this was as deliciously free range and full of taste as you can get, but with mysterious and herby undertones. Everywhere we went there were markets selling piles of the freshest looking vegetables and newly butchered meat. It was clear from the concentration on the face of the shoppers as they weighed vegetables with their hands and prodded cut of meat that Tibetans place a premium on freshness and taste. And mushrooms, they love mushrooms and fungi. Sacks of them were piled up in the market, and the further out into the border lands we went, the more we’d see. Mostly hanging from door frames drying. At one spot, our driver was almost beside himself with excitement. One of the locals had picked a particularly rare mushroom and was willing to to sell. There was much haggling and bartering before the dried goodies – looking like a string of dried ears – was stashed in the boot. 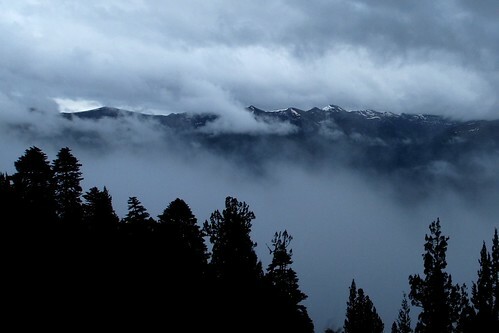 The misty forests in Eastern Tibet are packed with mushrooms and fungi, roots and berries, mosses and lichens. They hang from trees, sprout out of trunks, are buried in the dense black earth. And all of them are much sought after by Chinese and Tibetans alike. This hanging moss is good for throats, that brown woody fungus will fix your kidneys and so on. In a country that is rapidly industrialising its natural habitats, somewhere as remote and inaccessible as Eastern Tibet is an increasingly rare treasure trove of medicinal goodness. This is not without its bad side as turf wars over particular gathering grounds have started to turn violent, particularly when it comes to yartsa gunbu, a highly prized fungi-fied caterpillar. It’s known for its viagra like effects and demand has fuelled something of a fungi-rush. And although it’s bringing in the cash, the results are not all good with over-harvesting and land disputes. 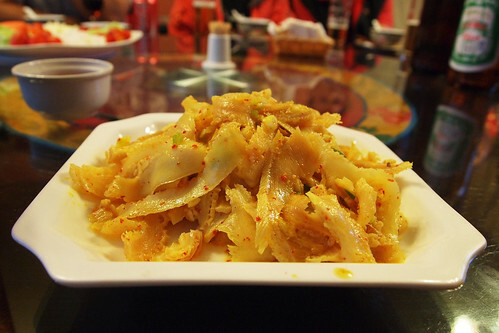 The more traditional foods of Tibet – such as yak meat momos (dumplings) and the pasty-like shebhali bread – are well represented in this part of the country too. 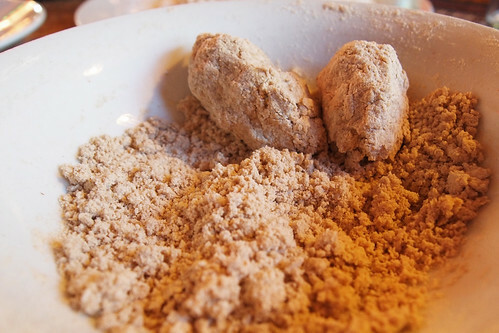 Tsampa, roasted barley flour to which you add a wee drop of butter tea and knead into an edible lump, was ubiquitous. My attempts were laughably crumbly, but still tasted okay, in a doughy kind of way. Better with chilli sauce. In Lhasa you need to try and get beyond tourist haunts like The Snowland (wall to wall tourists laughing and grimacing at the yak butter tea and barley beer). Cafe Yeti was a pretty good intro, but our blow-out banquet in Phin Tsok Ge Don was the real deal. It had been clear throughout the trip, and even more so there, that the gusto with which Tibetans tuck into meals, and the joy as they watch you try something local, and enjoy it, shows a genuine interest in good food. Everyone from our city-based guide to our country village hosts took pride in their food, beaming as we sipped yak butter tea, chewed on the local pork ribs and sweated their chilli sauce. I hope this is the first of many posts on your travels. And good on you that you went for the real McCoy foodwise – not that I ever doubted that you’d do otherwise! PS: I love the chicken foot shot. That chicken feet soup is my nephew’s favourite and he calls it Hand Soup, not a bit squeamish. As for the caterpillar fungus also known as cordyceps, we used a lot of this in making Tibetan Medicine and is also widely used in Chinese medicine. Due to the ridiculously high price now, there is a lot of fake stuff on the market but it is very powerful medicine. @May – they were interesting, and much more varied than i thought. Yeah, people were trying to sells us the fungus on every street corner in every town. It became tiring after a while. Interesting to know that is a powerful medicine though, I presume not just for the viagra effect? 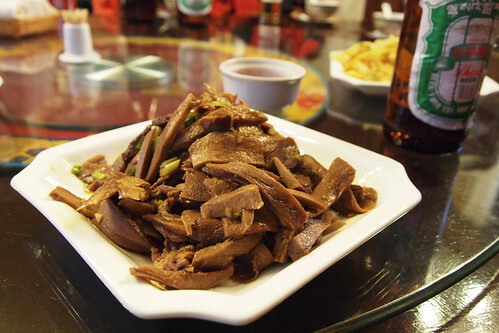 The yak tongue looks good, and I bet it tasted good as well. Can’t wait for more stories. Great photography & writing – I am really interested in visiting. @Leluu – thanks! It’s definitely worth a visit, even if the practicalities can be daunting. How brilliant! Looking forward to reading more about your trip! @Goiing with my gut – cool, thanks!